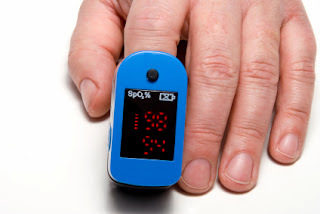 A pulse oximeter is a device that is specially designed to measure pulse rate and arterial blood oxygen saturation (SpO2) in a non-invasive manner. Both pulse rate and oxygen saturation level are considered vital signs of a person and they are measured in a variety of situations including operating rooms, emergency medical situations, flight training and high altitude adventure sports. Oximeter is an inexpensive option to receive an accurate reading in a matter of seconds. It measures the concentration of oxygen in the blood by the finger. A two-sided probe is placed over a finger. The device then keeps track of the finger tip's pulsating capillaries. Ideally, this reading should be somewhere between 96 percent and 100 percent. If the reading is under 90 percent, there may be a cause to be concerned and you should contact your medical professional. Why should one use oximeters? Low oxygen saturation in the blood, also known as hypoxemia, could potentially prevent your body from functioning like it should. Vital tissues could be harmed, causing confusion, fatigue, shortness of breath and even death. Thus it is important to use oximeters to monitor your blood situation level. In the earlier days, it was difficult to measure your blood oxygen level outside of a hospital setting since the machine being used was large required a cart to move it around. It was also relatively expensive and not everyone could afford to own one. However, pulse oximetry has advanced a great deal in the past few decades. Nowadays, oximeters are portable, compact, easy to use and come in a wide variety of price ranges. Pulse oximeters can be used for various reasons by both adults and children. They are frequently used by mountain climbers, pilots, athletes and other people who spend a significant amount of time at high altitudes. The device helps them to guard themselves against hypoxemia. The red blood cell count in these activities can be increased by the reduced level of oxygen which affects their endurance. Pulse oximeter can be used to monitor the circulatory problem known as peripheral vascular disease (PVC) that is especially common in diabetics. Diabetes patients also have a high risk of getting sleep apnea. Treating sleep apnea successfully can also help them to control their diabetes. Sleep apnea causes someone to have difficulty breathing while they sleep. This results in the person being deprived of oxygen which could possible result in depression, weight gain, heart disease, uncontrolled diabetes or a stroke. Pulse oximeters are frequently used to monitor patients suffering from chronic obstructive pulmonary disease (COPD), emphysema, asthma and various other respiratory problems. It is recommended that people who suffer from respiratory problems have their levels of SpO2 checked on a regular basis. In addition to at-home and sports use, medical professionals such as doctors, and emergency responders. Using one can enable a person to know more about their own health in a simple and inexpensive way and prevent any major health issues. If you would like to buy oximeters online or learn more about the different types available, please visit Concord Health Supply Online Store. Disclaimer: Please talk to your doctor before using oximeters.